We are only at the very beginning, but I feel that the introduction of Formula Drift into Japan has already had a very positive effect on the sport. 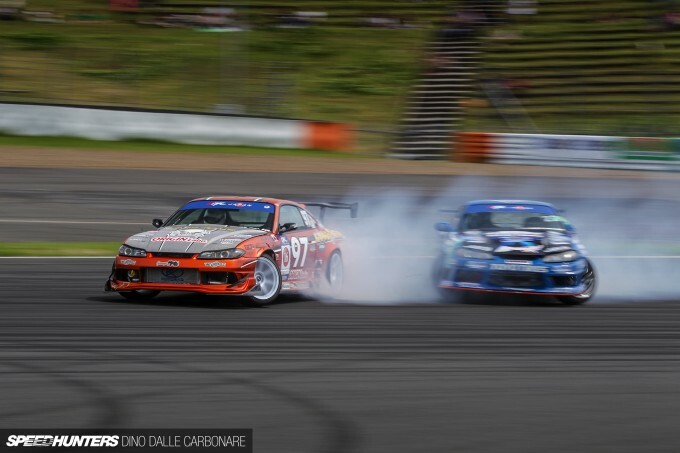 It all kicked off last July at Fuji Speedway when the first FD Japan round was held. There was a great atmosphere at that event – perhaps something that could be put down to the possibility of change, after what has felt like a decade of stagnation. I for one cannot wait for the 2015 championship to kick off next month at Tsukuba – one of the coolest circuits to drift at! Plus, the proposed drift section for the event – running the track in reverse and starting off at the beginning of the back straight, using the last hairpin as the first corner – will make things very new and fresh. It’s also great to see Japanese drifters getting excited about going head-to-head with a large international field of drivers in their home country. When I was at ORIGIN Labo last month I had the chance to take a closer look at a car I first saw at Fuji Speedway last year. 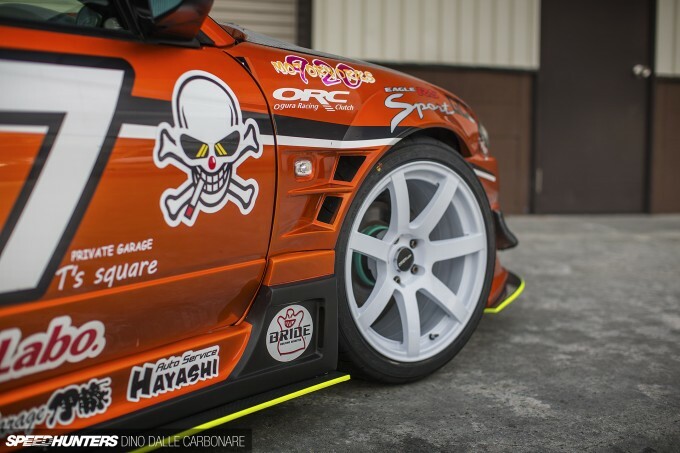 This is Kunihiko Teramachi’s Nissan Silvia S15 – a new build that has replaced the ORIGIN S13 he drove for a while in the D1 Street Legal series. While the candy orange paint is still there, this is a big step up from his old machine. It looked really cool sitting in the pits that Formula D weekend. I remember adding this car to my must-shoot cars list – something that over the years has grown so much that I now have no more brain space available to store it all in! On his first FD outing Teramachi did pretty well, surviving the wet practice and qualifying session of the previous day and then managing to win his first match match-up, which allowed him to move into the afternoon battles. While at ORIGIN Labo I also had the chance to spend some time with Nishida-san, the man behind the aero operation. I always like chatting to influential guys like this and finding out their perspective on things. It’s also cool to talk about the old days, where they came from, and what steps they’ve taken to ensure their brand remains influential. Nishida is a man that knows the Japanese drifting scene inside out – he was there when it all started, and it was at that time that he knew what he had to do. Aside from designing badass aero parts, there’s always been one important thing that’s kept ORIGIN Labo so relevant: the price of their kits. As Nishida told me, “One of my full kits is ¥70,000 yen – that’s less than the price of a bumper of some other brands!” Keeping prices low is something he has always focused on. And he has to, because drifters don’t have money to throw around on FRP bits and pieces. So it’s thanks to his prices that drifters are able to give a custom look to their cars without breaking the bank. And if stuff breaks at the track, it won’t be too painful to replace. In his own way, by doing this Nishida helps the whole movement evolve. 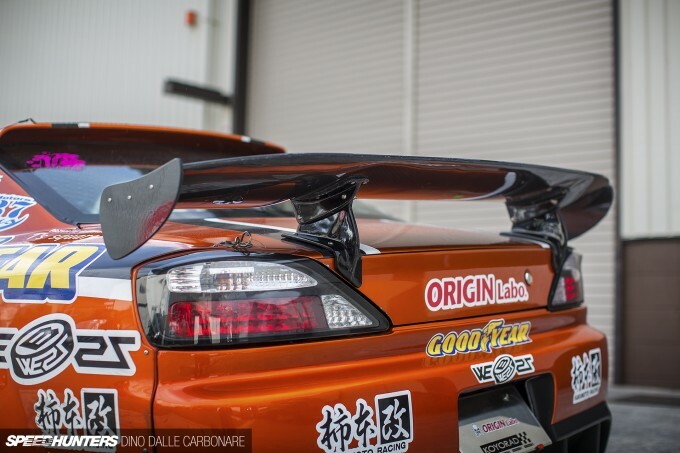 If you have some spare cash on the side though, there’s the full ORIGIN Labo catalogue of goodies to splash out on – things like vented and widened fenders, which in the case of Teramachi’s S15 add an extra 55mm of width on each side of the car. They’re a perfect match for the Origin DRF-S7 wheels – which start at less than ¥20,000 apiece for the smaller sizes – that Nishida has recently started manufacturing too. You won’t find lightweight forged production here, which is why they’re perfect for driving applications where you more often than not end up damaging pretty much every single component on your car! 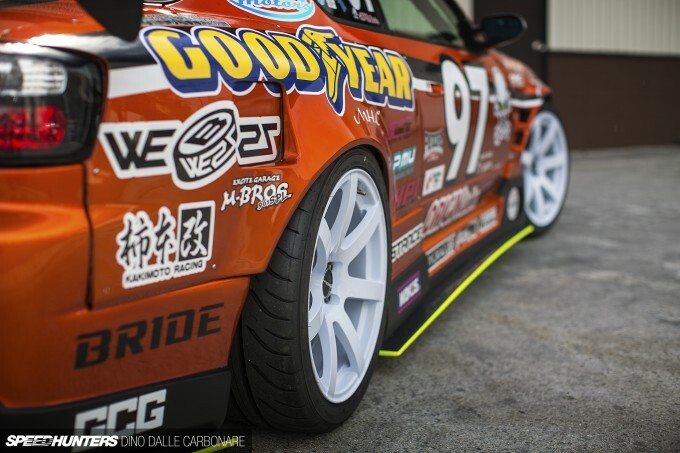 Plus, let’s not forget how many spare wheels and tyres one would take to a drift track day. To keep things balanced, a set of bolt-on ORIGIN Labo over-fenders were also fitted at the back. Screwed in place, they widen up the rear end by around the amount as the fronts. The pumped fenders allows the 18×9.5-inch wheels to fit nice and snugly under the rear arches, with just enough clearance for when the car squats down under power. The side skirts are joined by a secondary under-skirt carbon panel, which gives the illusion that the car is lower than it actually is. That treatment is carried over both front and rear with a series of carbon diffusers sporting a fluorescent yellow strip to really make them stand out. 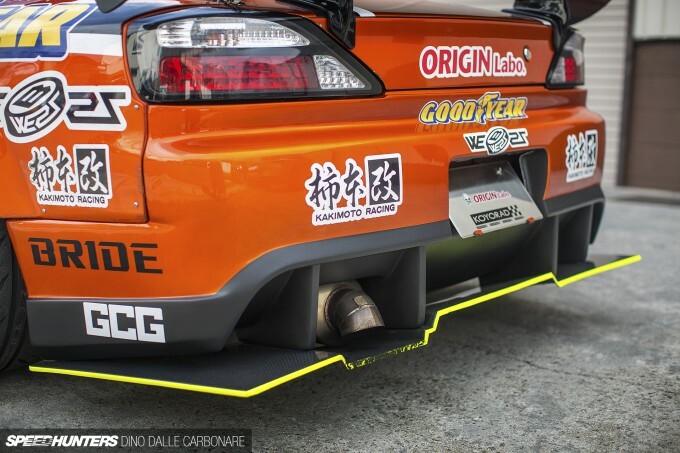 Kakimoto Racing, which we took a tour of about a year ago, was called in to fabricate up a custom exhaust system, and seeing as the S15 has been running in the D1GP series, it had to be fitted with a turned-down tail section, which is a requirement for city rounds like Odaiba. Is the era of huge GT wings done and dusted? It wouldn’t be a bad thing as it’s become sort of cliché on JDM cars, and more often than not it’s a modification that’s not even necessary. 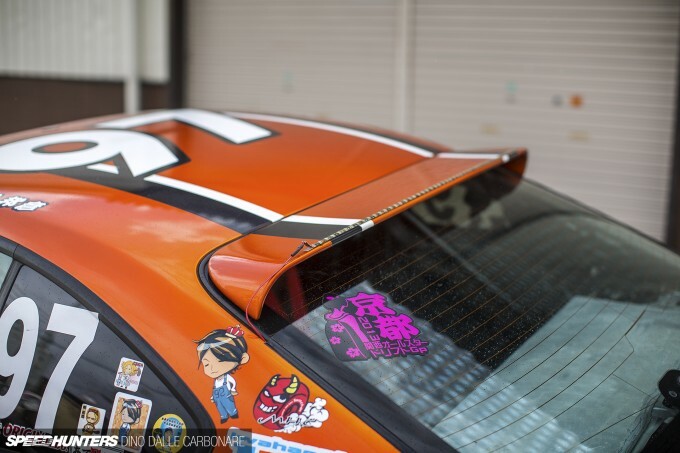 That’s why Teramachi opted to go with a more compact wing sitting on a low set of stays fixed to the FRP trunk lid. 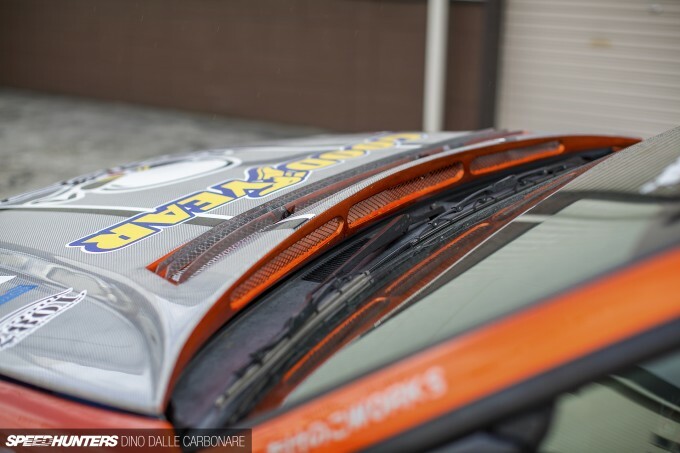 It’s joined by an ORIGIN Labo roof spoiler, which as you can see is fitted with a strips of LEDs. These are required in FD competition so that the judges can see if drivers are brake checking each other. 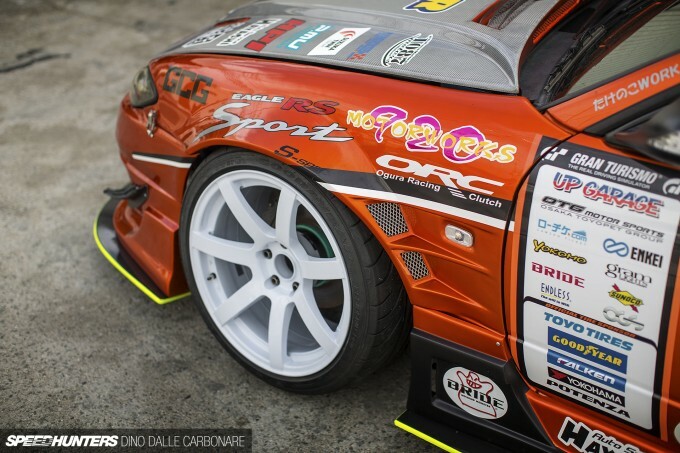 This Silvia is the definition of a modern day JDM pro drift car. It’s fresh and has that distinct Kansai feel about it thanks to the ORIGIN aero it proudly wears. In my opinion, one of the most interesting parts that Nishida-san makes is this bonnet. 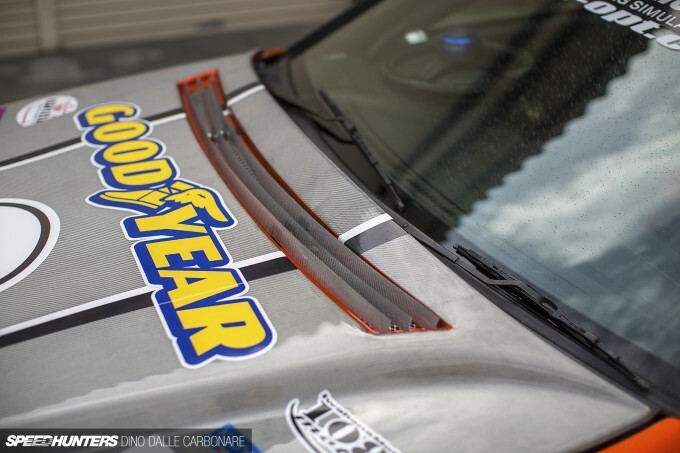 It’s vented, but unconventionally uses a double skin to channel air away from the engine bay and dump it through this louvered strip at the top. There are also three horizontal openings along the edge of the bonnet for more venting. After all, at speed there is a massive volume of air that’s moving underneath, on the side and over the top of the engine, so creating a way for it to leave while carrying some heat with it is pretty smart. 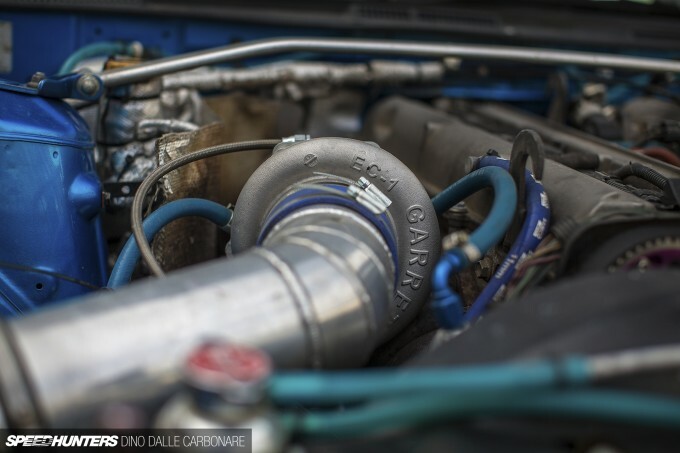 If you’re a die-hard Nissan aficionado this might seem sacrilegious, but there are plenty of reasons why it was decided to dump the SR20 in favour of a Toyota 2JZ. First of all, there’s the whole theatre of it. No matter how many 2JZ swaps we see – and let’s not lie, they are getting incredibly common these days – a big ‘wow’ always follows. Then of course there are the costs. 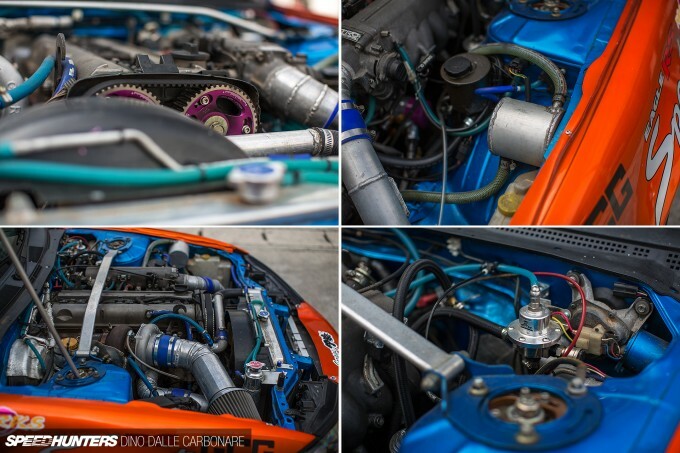 SR20DETs can make the power – just look at what Chunky Bai managed to do with his 180SX – but it takes substantial work and investment. 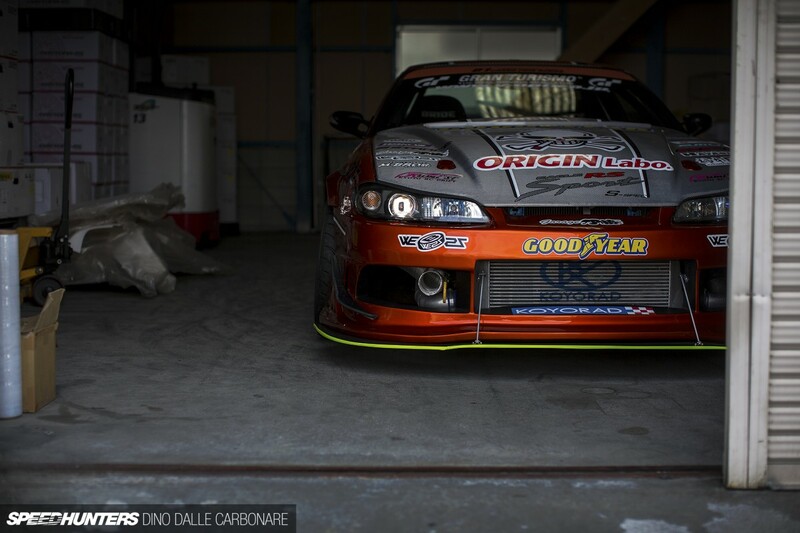 The 2JZ you see in this S15 uses a stock bottom end and develops 550PS without any issues. And being a Toyota engine it will do so until the end of time. 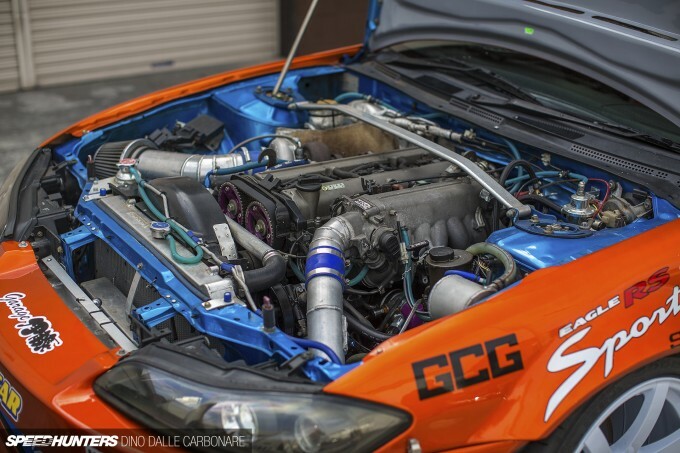 Boost is supplied by a GCG GTX3582R sitting on top of an HKS exhaust manifold. It has the potential to produce a hell of a lot more power, but that’s not required in this setup. Reliability is. The only real engine work that’s been done is the porting and polishing of the cylinder head. It now flows better and generates an all-important responsive throttle pedal, which comes in very handy for adjusting the car’s angle during a battle. 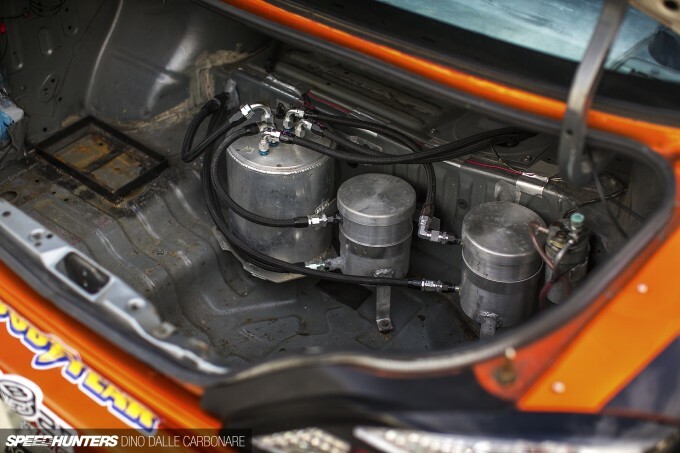 A serious fuel system lives in the trunk and supplies the necessary juice to the six SARD 800cc/min injectors. Of course, being a Japanese car engine management is taken care of by the ECU of choice: an HKS F-CON V Pro. There’s a fat band of torque through the mid-range, which tops out at 560Nm, and the engine is never revved over 7,800rpm. It’s built to take the abuse, as is the G-Force GSR 4-speed transmission. The G-Force is the transmission of choice for many FD cars, and that’s because it’s strong and reliable. In this application it’s mated to an ORC twin-plate clutch, with a Nismo GT Pro LSD completing the driveline out the back. Open the driver’s side lightweight door and you are treated to a simple yet functional cockpit. Once you tackle the two side intrusion bars of the 7-point Cusco rollcage you can drop into the snug Bride bucket seat and securely fasten yourself into place with an HPI harness. This is the sort of view you have. 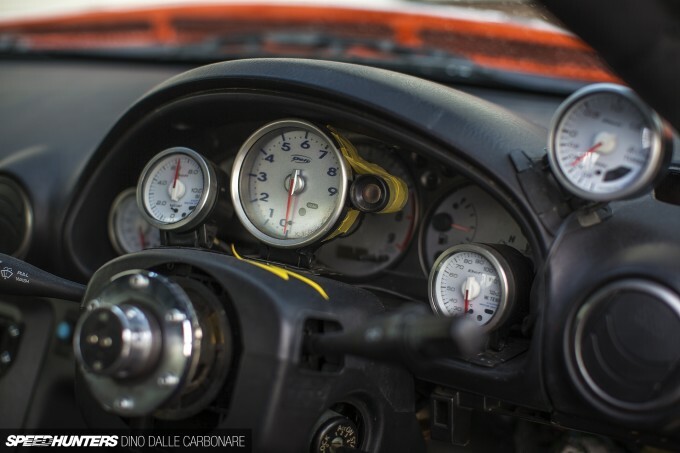 Seeing the 2JZ-swap made the stock instrumentation redundant, there was a need to at least fit the necessary gauges so that Teramachi can keep a close eye on what his engine is doing. Everything you see is from Defi, starting off with a large centrally-positioned tacho, and then four temperature and pressure gauges mounted around it. It’s not a pretty setup, but it does the job. For easy access, the F-CON V Pro is mounted in the centre console with its connection ports exposed. It’s joined by a little cut-off switch for the electrics as well as a Blitz boost controller and the control unit for the Defi meters. Undo the quick release latches at the rear and you can quickly access the fuel system. There’s a massive swirl pot here to make sure that the fuel picked up by the pump is free of air. Expect to see Teramachi in full maximum attack mode next month at Formula D Tsukuba, and unleashing all the might his bulletproof driveline can muster. There are only four FDJ rounds planned for this year, but despite that I’m positive that a foreign series entering ‘the home’ of drifting can only have a positive effect. 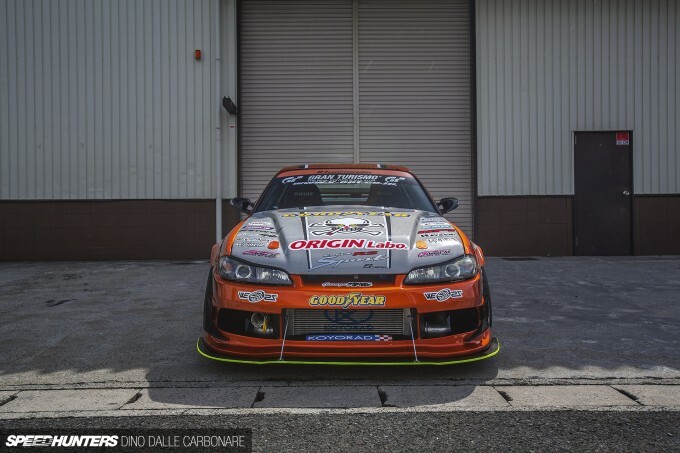 It’s a simple recipe if you look at it in isolation – bring a bunch of likeminded professional drifters from around the world together in Japan and only cool things can happen! if you want to see somethink cool, We are doing a 2JZ swap in to a 350Z maybe the 1st road car in the UK with it. I like this, no frills on the inside bits. I haven't actually looked into it myself yet, so you are more than likely correct...but are you sure they are using the final hairpin at Tsukuba as T1 of the FD section? Only reason I ask, is that final hairpin is in no mans land...there's nothing to really link it to (going in the reverse direction)....unless they add a Manji or something? It seems more likely to me that they would use the short track in the reverse direction. There's much better flow, and I would think there's better viewing for spectators. Wait, the down-turned exhaust is a legal requirement? Why's that? I just thought it was something cool from the RE-amemiya cars. I respect the 2jz and LS engines but theyre boring. At least the Americans come out with new performance engines though American big 3 products bore me. Its a shame the Japanese dont produce more performance products. Twitch_6 I could see starting from the Dunlop corner and going reverse, but the final hairpin? thats 300yd straight, slight turn, another 200 yds straight. Very odd, will need to see how they run it. So....A bolt-in cage is FD Legal? I though it requires NASCAR-style door bars and welded in? I mean nice car and all, but if that's what they are letting in to FDJ then a lot of Americans are gonna be pissed. Twitch_6 its formula d remember? its sideways drag racing. D1RGE afaik going with FIA regulations you need door bars when doors are replaced by FRP or Carbon Fiber, as long as doors are stock, you don't need door bars. Yet, most of people build in full race rollcage for security reasons. I'm afraid you have it all wrong...this is a 2jz swap done right. D1RGE, that's sort of what I was thinking. Either they will initiate on the back straight, and use the Short Track to cut through the motorcycle chicane, then go left around Dunlop, and link the straight to the hairpin. I could also see them rolling reverse through the final hairpin, accelerating down the curved straight (curves right when going reverse), and then initiating for the slight sweeper before Dunlop. 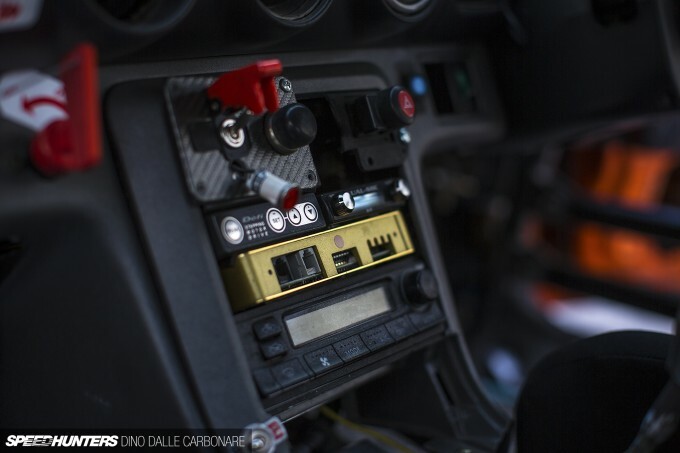 This config would be much less technical...so it might be right up FD's alley lol. Linking the 2nd hairpin all the way back to the 1st hairpin is definitely possible, but it's not a great tandem section, and usually requires a pretty long e-brake drag to make the entry to the final corner. They were D1 legal fwiw. I hate to be pedantic, but the bonnet venting at the base of the windshield does not remove air from the engine bay but usually forces it in. The base of the windshield is a high pressure zone and many race cars such as NASCAR take advantage of this to pressurize airboxes. Depending on the rest of the cars aero (underbody, etc) this could be effective or just end up being cosmetic. marshalljung That's not pedantic. My Miata has a cowl induction intake, it comes right from the base of the windshield. Smiggins I will never understand these complaints. Why cry about cheap, reliable, accessible power? If the LS was a Japanese motor every fanboy would call it the best motor ever. The Coyote is a DOHC 5.0L engine that makes torque everywhere. The Voodoo engine is even more awesome. The LS doesn't need an intro. What's wrong with these engines other than being American?